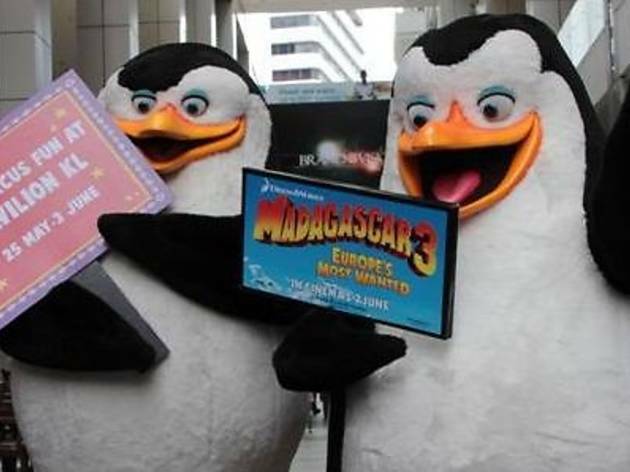 In conjunction with the release of 'Madagascar 3: Europe's Most Wanted', in which Marty and his friends follow a travelling circus through Europe in hope of returning to New York, the lovable penguins of Madagascar will make a pit stop at Pavilion KL. There will be special live shows (May 25-27, 3pm & 7.30pm; May 28-June 3, 3pm & 7pm) and meet and greet sessions with the penguins, so make sure you have your cameras ready. Aside from that, you can look forward to Pavilion's centre court area being transformed into a mini circus with bungee trampoline rides (RM15 per entry), carousel rides (RM3 per entry), cotton candy and popcorn stalls and more. The brave and brawny can also test their strength on the Mr Hammer (RM3 per entry). The first 50 Pavilion Juniors and 50 shoppers daily will get free admission. 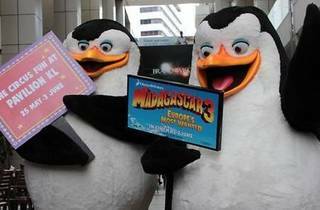 You can also spend RM100 at any children's specialty store at Level 5 to redeem a pair of 'Madagascar 3' movie tickets while stocks last.